Geberit, the name synonymous with wall-hung toilets is the preferred choice for many when shopping for a wall hung toilet carrier. Which, quite frankly needs no introduction. But if you are only starting to look into a wall hung toilet, then this article is invaluable for your understanding and choosing a good in-wall system. What is Geberit and why? Established in 1874, Geberit is a Swiss multinational group specialize in manufacturing and supplying sanitary parts and related systems. In 1976, it expanded into the USA and established the subsidiary Geberit Manufacturing Inc. with its headquarters in Michigan City, Indiana. And today, its concealed cistern has over 60 million installations worldwide. The track record is a clear testament to the product quality and the company’s commitment to excellence. And that’s the first reason why you should consider a Geberit in-wall system. The other reasons? Read on. How To Check Floor-Mounted Toilet Bowl Compatibility? When you choose a Geberit Duofix carrier, you are opening yourself to the widest range of wall-hung toilets. You’ve got 16 brands with a combined total of more than 150 toilet models to choose from; you will either love it or hate it. But chances are, you will love the freedom of choice more than the competition could offer. And that includes the all Americans’ favorite KOHLER, TOTO and DXV (American Standard), along with other well-known European line of wall hung toilets. The advantage of having a whole host of toilet options present a unique opportunity to swap toilets without access to any part of the carrier that’s in the wall. You can be using a KOHLER bowl now and later found a Duravit model that is even more appealing; you can do a bowl replacement easily, without the need to rip out walls and all that. You just need to make sure the replacement toilet bowl model is compatible with whatever Geberit in-wall carrier you are using. Think of it like the Swatch of wall-hung toilets. The options are vast, and you only have your imagination as a limit. You can take your imagination to the next level with Geberit’s breathtaking range of flush plate designs. Whether your bathroom design instills an atmosphere of fun, elegance, smooth or simply functional, Geberit flush plates will have you covered. In fact, this is what attracts toilet manufacturers to want to partner with Geberit for its in-wall carrier system besides its impressive track record for reliability. After all, there isn’t much you can do with the ceramic bowl design other than just color and shape. Choose the right Geberit flush plate, and it will speak volume of your refined taste for aesthetics. It gives any bathroom the uplift of class and character amid the functions. It’s a designer’s secret weapon for the finishing touch of their prized bathroom design. But that’s easier said than done. While it’s easy to choose a Geberit in-wall carrier, which you will soon find out, it’s a jungle out there if you are trying to pick a flush plate to match your bathroom design. But don’t worry, the heavy lifting is done. You will breeze in with just 5 easy steps, and the perfect flush plate will appear right before your eyes. With over 100 models of flush plate and button, it will make this post the longest in the history of toilet reviews. So instead, a separate page is put up to get things organize for your easy read. But more important is to help you find the right flush plate without feeling overwhelmed. From here onwards, you are going to dive deep into the features of Geberit in-wall carrier. And you are going to love the options available to you. Yes, even if you are just replacing your regular tank and bowl toilet. But first, relax. There isn’t a ton of part numbers or models you need to learn or remember. There are only six Geberit in-wall carrier models here, and it is super easy and straightforward in choosing them. Alright, to make it even clearer for you, here are all the models with their respective flushing capacity and wall stud size. And all 6 models are without the flush plate and toilet bowl; you will need to purchase them separately. In case you are all ready to buy, here are the 6 Geberit Duofix in-wall carrier models. Or read on to find out more. The metal frame of Geberit Duofix Carrier is a 16-gauge powder coated steel structure. This description may seem a little daunting to a layman. What it means is, the thickness of the steel is 16-gauge (1/16″ or 1.65 mm thick), and the steel surface is painted (coated) with epoxy powder which is heated to fuse into a protective layer. The epoxy paint will not peel nor crack and resistant to scratch to some extent. Unless a deliberate forceful scratch with a hard and sharp object that cuts through the paint exposing the steel, rust won’t happen. The coat is to protect the steel from rust and corrosion. In the same way, that’s how industrial machines and equipment get their coat of paint. So give attention and care to the paintwork during installation. And if you see deep scratches on the frame surface during unboxing, return the goods and get a replacement. But don’t get paranoid over this, minor scratches or indent caused by washers or nuts is no harm done. However, not every part of the Geberit frame is powder-coated. The friction feet is galvanized, which has a protective coat of zinc. And just like the powder coat, it is to prevent rust. Treat it the same way like the powder coated main frame body. The overall frame construction is sturdy and corrosion free that will last a lifetime. And all six Duofix frames can support a maximum weight of 880 lbs (400 kg) without causing damage to the finished wall. One of the improvements made by Geberit to its 2×4 carrier frame is the frame width. Previously, the 111.728.00.1 carrier has a width of 23-1/4″, which is a typical width size for most 2×4 in-wall carrier frame you can find in the marketplace. With a new frame (111.798.00.1), the width has shrunk to just 19-3/4″. And this is the same width for all the other five models. So that gives you the advantage of a better utilization of wall space. This uniformity of width removes the dilemma of deciding which stud size to use like in the case of the 111.728.00.1 previously. That’s quite a relief when you are faced with a teething space constraint issue and especially cost. You can now escape from the shackle of the higher cost 2×6 wall stud when you only need a 2×4 because of the frame width. So that solves your small space problem and saves plenty of money. The flushing mechanism and the tank are built to last and free of maintenance. All parts of the flushing mechanism are of high-grade plastic. You won’t see any metal parts like the ugly chain, bolt, and rod. The rubber ring and gasket are of thick premium grade which can resist the corrosive water better than most similar products out there. So that takes care of all the rust, corrosion and degrading rubber seen in most flush valves typically. And that means you have got a system design to be free of leaks since all the parts are resistant to the corrosive nature of water. Even on a rare occasion when you need to replace the flush mechanism, it is easy to access through the flush panel. Even better, you can carry out the replacement without using any tools. The tank is a one-piece, blow-molded plastic. There are no welded seams or weak joints to worry about hairline cracks causing leaks. According to Geberit, every tank that leaves the factory has gone through a rigorous test to ensure 100% watertight. The tank is also protected with an insulating cover against condensation. Unlike a floor-mounted toilet, wall-hung gives you the flexibility to choose the sitting height. With a Geberit in-wall carrier, you can set the seat height from 15″ to 19″ during installation. You may think this is trivial but not to the folks with some disability, especially to those who are wheelchair bound. You can set the height to the same level as the wheelchair, so it’s easier to move over. Ask the caregivers; they will understand better and appreciate this convenience. And because of this possibility, all Geberit in-wall carriers are ADA Compliance. But don’t get the perception that this is only beneficial to the disabled. As you age, an inch difference can help ease some pain on the knees. So, if there is a senior in the house, this is a must-have feature. Even if you don’t need a comfort height now, you will appreciate having the option to change the seat height later*. *Requires full access to the in-wall frame. What irks people the most in any household is none other than the embarrassing toilet flushing noise. In some extreme cases, it can deprive sleep. You really can’t do much to muffle the sound especially when you have a small bathroom with a floor-mounted tank and bowl toilet. But when the tank and flushing mechanism are concealed behind a wall, things get a twist for the better. As the wall now act as a sound absorber, you won’t experience the same decibel level as with the regular tank and bowl crapper. Even better with Geberit in-wall carrier where the tank is wrapped with an insulating cover, it certainly helps in reducing the noise further. And that’s not all. The redesigned fill and flush valves are now acoustically insulated; you can now flush like nobody is in the house, even you’ve got guests at the dining table. And to the light sleepers, it’s a lifesaver. There are only two wall stud sizes – 2 x 4″ and 2 x 6″. It can’t get any simpler than that, isn’t it? Either one will do the job on a standard room height wall. Your choice of the in-wall carrier will depend on your wall design. So before you pick a Geberit in-wall carrier, you will have to decide with your builder on which wall stud size is better for your requirement. And if you have concerns about condensation, then you are better off to go with the 2 x 6″ wall stud. The advantage you get from the 2 x 6″ stud is more air space around the tank which will further prevent water condensation. Otherwise, the 2 x 4″ model is good enough. Anyway, both the tanks are insulated against condensation, so you shouldn’t be overly concern. The cost difference between 111.798.00.1 (2×4) and 111.335.00.5 (2×6) Geberit Duofix Carrier is about $50 to $60. And this two are of the 1.6 / 0.8 GPF flushing capacity. The price difference for the 1.28 / 0.8 GPF models are probably about the same. The 2 x 6″ pre-wall model is a low-height carrier frame. Good for installation under a window or ledge wall, or places with a limiting height. The beauty of this shorty is, you can almost plant it anywhere you fancy. And the flush plate can be installed for top or front activation simply by swapping the actuator position. All the six carrier offers dual flush function with 1.6 GPF / 0.8 GPF or 1.28 / 0.8 GPF full and partial flush respectively. However, you can opt for a single flush by choosing a single-flush flush plate which is available for both the Sigma and Omega concealed cistern. Geberit in-wall carrier is compatible with almost every wall-hung toilets by major toilet manufacturers from Asia, Europe, and the United States. Even though some of the toilet manufacturers have their in-wall systems, they lack the variety of flush plates Geberit offers. And the wealth of parts and accessories to meet every installation needs is what makes Geberit the market leader for its in-wall toilet system. The possibilities are endless with a Geberit carrier. To the extent, it’s like there is an unspoken procedure in shopping for a wall hung toilet. Decide on a Geberit in-wall carrier first before choosing the bowl. Or you will be limiting your option for flush plates and flexibility on installation. You can take these 4 steps to verify if the bowl is suitable for Geberit in-wall carrier. The bowl must be designed to flush with 1.6 GPF (6.0 LPF) single flush or 1.6/0.8 GPF (6.0/3.0 LPF) dual-flush – similarly with 1.28 GPF (4.8 LPF) or 1.28 / 0.8 GPF (4.8 / 3.0 LPF). If you are not sure about this information, check with the toilet bowl manufacturer. There must be only two mounting holes on the toilet bowl. Any more than 2, no go. The water inlet must be at the back of the bowl. It simply means the flushing water must flow into the bowl via the back. Otherwise, no go. Before proceeding to step 4, you must meet all the three criteria above. Failing any one of the steps, you can’t use a Geberit in-wall carrier. Check dimensions. There are three critical dimensions you need to meet. And if one or none of the dimensions matched, or you can’t figure out any of it, don’t give up. You can contact Geberit Technical Support for further assistance. The helpful tech support will guide you through with some suggestions. With over 150 wall hung toilet bowl models to choose from, it’ll drive you crazy to go through every single one of them. But you can narrow them down according to your preference like MaP rating, WaterSense labeled or simply by their appearances. Or just go with the popular ones like TOTO, Duravit, and KOHLER. However, do note that the list also consists of manufacturers who may not have their presence here in the United States. Service support can be a real pain in the rear. So before you land your hands on one, make sure the parts and accessories are at least, fairly easy to get. And not at an exorbitant price simply because there isn’t an alternative you can consider. Here’s a list of all compatible wall hung toilet bowl brands and models extracted from Geberit’s catalog for your easy reference. The downsides of Geberit in-wall carrier are pretty generic, to say the least. It will be more appropriate to refer the disadvantages to all in-wall carriers instead. Not that Geberit carrier is flawless, but it would seem like nitpicking just to make a nice paragraph. So if you are new to wall hung toilets, here are 3 main disadvantages for your knowledge. Unlike an external toilet tank, the only way to get to the internal parts of a concealed tank is through the actuator flush panel. You can imagine the difficulty when you are trying to fix a problem in the tank or just regular maintenance. You will wish your fingers have eyes. Which is why Geberit designs its flushing mechanism to be maintenance free (Or should it be easy to maintain?). Even when you need to replace the flush or fill valve, it’s not that hard as you would imagine. Watch the video below; you decide if this is a disadvantage, and see if you can spot any tools being used. Though the specification says the carrier can hold up to 880 lbs, it means nothing if the wall can’t match or exceed the maximum hold-up weight of the carrier. Or when the frame is not properly secured with the right material, it will also lead to problems later. Any negligence can have dire consequences and you are akin to installing a time bomb. Repairs are going to be costly for sure. If you don’t want the possibility of the bowl crashing down while you are on it, then you better have a qualified person to do the installation. And not any plumber Joe you found on Craiglist. You would want someone who knows wall structure better than he understands his wife to do it for you. But where can you find this expert? A good place to start is HomeAdvisor.com. They have pretty decent reviews over at ConsumerAffairs (Very impressive actually). Otherwise, you may have to hunt down a local contractor who has the expertise and experience with installing wall-hung toilets. As a matter of fact, 880 lbs is a lot of weight. But still, it is a limit as oppose to a floor mounted crapper on solid ground. Period. Did you just change your mind after learning the disadvantages about wall hung toilets? Well, don’t. It’s not that bad actually. Just Geberit alone, it has over 60 million installations worldwide, and more than 90% of toilets in Switzerland are wall hung just can’t be wrong. It is as safe as the floor mounted water closet. In fact, it is even safer with the tank hidden behind the wall. You get lesser obstruction or barriers giving you more open space and accessibility. Besides looking neat, cleaning is a lot easier with no hidden areas for mold, dirt and creepy crawlies. So stay with your plan, get a wall hung toilet and be sure to use a Geberit in-wall carrier. You are going to love it. That will be ideal when you are building a new bathroom or remodeling an existing one. And you prefer masonry walls or cinder block over panelized stud walls. Regardless, that will be the smartest decision for you as you will have more flexibility over the in-wall carrier. 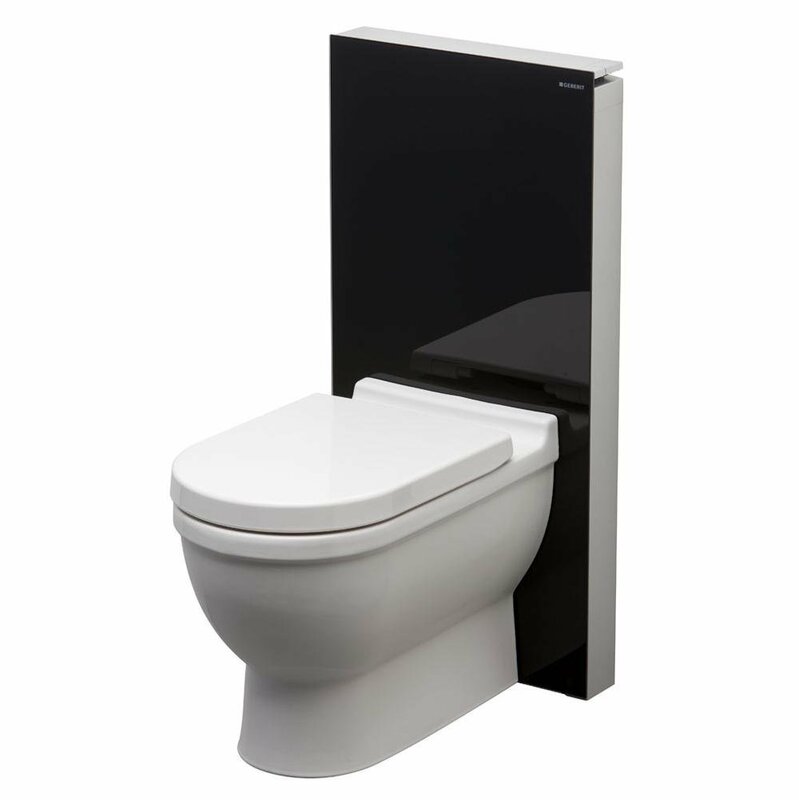 The biggest advantage of the Geberit Monolith toilet is accessibility. Maintenance is even easier as now you have access to the flushing mechanism like a standard tank and bowl toilet. And you can opt for a wall hung or a floor mount model. It is just as eye-pleasing that will complement any modern or contemporary bathroom designs. And because the carrier doesn’t need to be in the wall, installation is a lot simpler. As long as the drain pipe is all done up within the wall cavity and positioned for the seat height, you can pretty much do the installation yourself. But unlike the Duofix carrier, you only have 1.5 inches for seat height adjustment (17-1⁄4″ up to 18-3⁄4″). That’s the only drawback with the Monolith if you are one of those people who doesn’t want a comfort height toilet. Other than that, you have the same benefits as the Geberit in-wall carrier for a wall hung toilet. If you are considering to replace your existing floor-standing toilet to a wall hung, the first thing to do is a feasibility study of your existing supply and drainage pipings. It will be wise to hire a professional plumber to help if you have no idea what it entails. Re-adapting the waste pipe for a wall hung toilet can be complicated and costly. If you want that wall hung toilet so badly, you better have a budget that’s enough for a remodel. The bulk of the money is in the works, and it can cost more than the in-wall carrier, and the toilet combine. Otherwise, consider the Geberit Monolith Floor-Mounted installation. You can save a ton of money and still gives you the clean line look of a wall hung toilet. Maybe there’s no need even for hired help on installation. If you can handle a power drill, can saw some plastic pipes and comfortable with using a measuring tape, you can do the installation yourself. Don’t believe? Watch the video below then. As seen in the video above, this Geberit Monolith Floor-Mounted toilet can replace any floor mount tank and bowl toilet regardless of the rough-in size. There is no hacking of the floor or wall, and no need to deal with any pipe relocation. A competent plumber should be able to breeze through the installation. And the cost should be about the same as a typical toilet installation. But why waste it on a plumber? Don’t you think it will be a nice and easy project on a weekend? Of course, that’s entirely up to you, and you are probably eager to know the cost. If you think the Geberit Monolith system will easily cost more than the tank and bowl crapper, you are right. But if you compare the cost of a one piece tank and bowl toilet, you might be wrong. Here are the models as seen in the video and available on Amazon (Right after the image). But wait. It looks like both the video and the offers are using the Duravit Starck3 elongated toilet bowl. What if I prefer another toilet bowl? How can I tell if a floor-mount toilet is compatible with Geberit In-wall System or the Geberit Monolith? A sure fire way is to get one of the floor-standing toilet bowl models from the compatible bowl list. But again if you are going for one that’s out of the list, here are the steps to confirm if it can fit on a Geberit in-wall carrier. Since there is no need for bowl support, there is no concern for mounting holes. So just three steps here. Check that the bowl is designed to flush with 1.6 GPF (6.0 LPF) single flush or 1.6/0.8 GPF (6.0/3.0 LPF) dual-flush. You can easily obtain this information from the product catalog or check with the toilet bowl manufacturer. Water must flow into the bowl via the inlet at the back of the bowl. If the water inlet is at the top, you can’t use a Geberit in-wall carrier or the Monolith. Before you proceed to Step 3, make sure you comply with Step 1 and 2. Otherwise, the bowl is not compatible with Geberit in-wall carrier or the Geberit Monolith. Check the water inlet and waste outlet arrangement. The water supply inlet should be located above the waste outlet. Take a measurement between the center of the water inlet and waste outlet. Check the diameter of the water supply inlet and compare with Geberit recommended dimensions. Check the waste outlet diameter and compare with Geberit recommended dimensions. Finally, contact Geberit Technical Support and provide them the information you obtain through Step 3. Geberit’s technical support staff should be able to advise you if the bowl is a good fit for their in-wall carriers. This is a very short list with only 4 manufacturers and about 20 models. Here’s the complete list of compatible floor-mount toilet bowl brands and models extracted from Geberit catalog. If you intend to install a wall hung toilet, the main thing you need to get over is the drain pipe installation. Which is why in most cases, it is easier to implement from scratch when everything is still on the drawing board. The other consideration which bothers many people is space limitation. If that is the case for you, all the more you should go for a wall hung toilet. You not only can save significant front-to-back inches but also the sides are easier with Geberit’s narrower frame size. With just 19-3/4″ wide, it gives you more freedom to better plan your bathroom layout without incurring unnecessary cost. Whether you are going to set it against the wall or filling a corner space, Geberit has all the parts and hardware for your smooth implementation. And with the vast variety of flush plates and bowls, your bathroom will look and work just the way you desired. Don’t leave out Geberit in your new bathroom plan, nuff said. Add to Flipboard Magazine.